Found everywhere in South Africa's central and western parts (from the north to the south, including the whole of the Free State), but nowhere in any of the eastern parts (thus absent from the north to the south). The silver coat of this little fox, especially in its winter thickness, is a prized piece of fur. 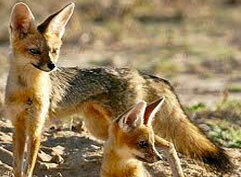 Nonetheless, the Cape Fox have escaped endangerment thus far. This animal prefers nigh time to wander about. During the day it mostly enjoys the comfort of its own burrow, dug by itself, although they might be seen in dense grass or hideouts as well. It knows how to capture a mouse or rat, while it also feeds on various insects. It is disputed if this fellow holds any danger to newborn lambs.